A simple but flexible tool to create automation curves. Usage: select a range in the automation editor, right click on it and choose "Autobender..." from the menu. 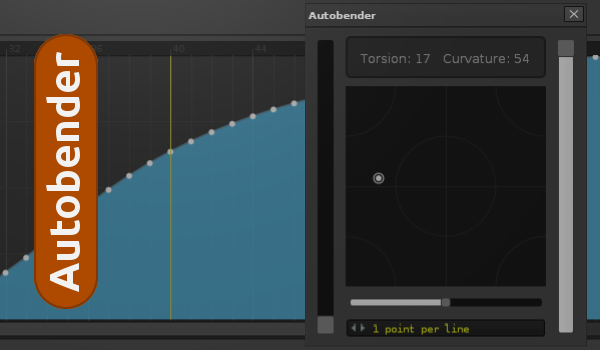 The curve is created in real time while you adjust the parameters. The two vertical sliders set the start and end values (they are also automatically updated when you change the selection). The vertical axis is the curvature (i.e. strength of the curve); center is a straight line. The horizontal axis defines the position of the curve in reference to a straight line: from left to right; in the middle the curved is shaped as a "s". The horizontal slider adjust the "character" of the curve : middle is exponential, left is logarithmic, right is sinusoidal(-ish). The box at the bottom defines how points are spaced on the curve. Finally, the padlock icon at the bottom lock the currently selected range; this way you can make another selection and open a new Autobender window which will operate independently. This allows to edit multiple section of an automation curve at the same time.